Daily Mirror - WHO WANTS YAHAPALANAYA, DESIRE A RAJAPAKSA? WHO WANTS YAHAPALANAYA, DESIRE A RAJAPAKSA? Where are the youth, fired with idealism fighting injustice, after the best were killed by the JVP, LTTE and the State in the late and early, twentieth and twenty first centuries including much of the second tier leadership of political parties? Who wants the Yahapalanaya (good governance)? Not Sri Lankans, for sure. More thrive on mis- governance or are beneficiaries of serial corruption that has trickled down with the advent of free economy. They voted for Yahapalanaya because they were not for excessive corruption by a few - relations, friends and boot-lickers of the Rajapaksas. 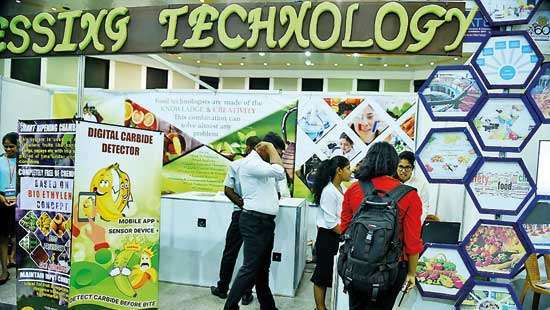 Families support irregularities if benefits flow to them like obtaining jobs outside the rules of meritocracy; some say, Rajapaksas’ sold that for a price too. Stories were sold; however flawed. Now, voters realise that Wickremesinghe (after the massive bond scam) and Sirisena (after appointing defeated candidates to Cabinet portfolios and not pursuing them through the FCID) are no different to the Rajapaksas’! Living was cheaper under the Rajapaksas, wisdom in holding elections in 2015, may make the difference, notwithstanding astrology. Another regime change is in the making? People having lived on corruption are blind to corruption, as long as they are also fringe beneficiaries. In a democracy, voting is a weapon through which regime changes are made, to replace one set of rouges with another. Is memory short, that people keep on changing pillows to reinstall rogues sent home or placed in office, with no other choice in the offing? Men in Society PRA, alive - are all over the place, living in disguise. Politics is no longer people’s power alone, with high finance playing a decisive role with the concepts of free economy in play; changes envisaged through the Constitution cannot cure the impact high finance inputs and reduce impact good men have on methods of electioneering. Way back, Lal Jayasundera, in post-free economy times, was a business leader, declined to make financial contributions to party campaigns, yet made a negligible company, situated primarily in an outstation, a giant in the commercial world in the city center. Jayasundera had a few great characters at Hayley’s and at the national airline carrier; knew the art of selecting people and entrusting power to them. Enlightened leadership, has confidence to assign work to the correct people without keeping power within a narrow circle of sycophants. A characteristic found wanting among the prime administrators of the Rajapaksa regime, led to the down fall of a president. Rajapaksa often entrusted power to wrong persons as he assigned tasks too liberally and failed to supervise them due to an inherent lethargy; Premadasa and Gothabaya did supervise comprehensively and gained fame for their projects. Look at the two named stadiums-at Kettaramaya and Hambantota, of the funds at Hambantota much of it is alleged to have shifted to private pockets. May Day rallies were mobile rogues’ galleries parading on the streets of Colombo, Kandy and Hatton. Stand up, lads and lasses, May Day participants are a negligible few purchased by those collectors of filth and dirt, totals after an islandwide search by politicians in collective -to the strength of number of voters in three electorates aggregated together in Colombo, as against nearly 195 other electorates in the country. Don’t be fooled by pictures in the media or by prejudiced columnists that glorify events, to become a part of an outfit or the speakers at rallies, instead, take a closer look at the pictures- are they not the dead wood, desperately trying once more to have themselves re-elected and come begging for the vote to live in luxury with perks and perquisites? Good or the better, stayed at home away from the rallies and constitute the bulk vote. May Day is essential to redistribute illegally amassed wealth, among the assembled cadres. Nothing more; nothing less-in a land of robber kings. Those on stage were primarily artists waiting to stage a comeback. Where Free Economy and Democracy walk hand in hand, Yahapalanaya is a business proposition for the NGO sector to make more money in pretending to be mock angels. In 2015, the Government after the victory over terrorism, lived too long on gratitude, believing it is a lifetime carnival, while overdosing the people with corruption sleaze and maladministration. 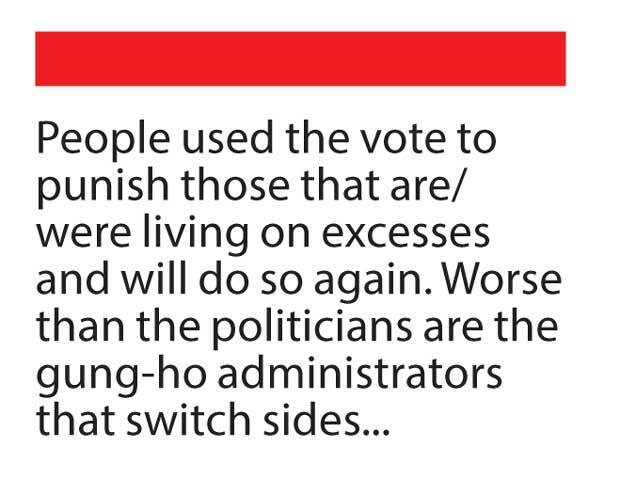 People used the vote to punish those that are/were living on excesses and will do so again in twenty twenty. Worse than the politicians are the gung-ho administrators that switch sides and are the beneficiaries under every corrupt administration. Genuine good governance kids and sadhus have gone underground living in shame and guilt, while the typical NGO types are thriving, searching for more loot. Senanayakes and Bandaranaikes were honourable politicians lived in eras that produced gems as were M.D. Banda, U.B. Wanninayake, Gamini Jayasuriya M.D.H. Jayewardane from the UNP and two poor carpenters from the hill country - William Fernando (Nuwara Eliya) and N.M. Appuhamy (Bandarawela) from the SLFP, lived small, travelling to Colombo on the railway warrants issued to Parliamentarians as they could not afford to run a vehicle for sittings, having shared with them as a paying traveller a clean first class bunk cabin in the night mail trains, while their assistants stayed awake in the third class carriages. Named Parliamentarians were first elected long before the free economy was introduced. Mrs. Sirimavo Bandaranaike was the last Prime Minster, twice banished Parliamentarians for corrupt practices and at the by-elections held to fill those vacancies won and lost seats for her party and cared less. Today the Government is afraid to hold elections on schedule to local authorities as defeat stares at them. In the North East demerger case in the Supreme Court, one of the petitioners from Ampara District, a young JVP MP, during the troubled times came for court sittings in a night run public bus as his car was taken over by his party. He did not miss a single sitting in court traveling in a bus to and fro from the Eastern Province. H.L.de Silva and I met Mahinda Rajapaksa in better times before 2009 and requested him to find SLFP MPs’ as we felt they had security that ordinary petitioners in the demerger case would not have, as against possible LTTE retributions and it was Rajapaksa that directed us to find MPs from the JVP as he felt his party MPs will ask him for too many benefits that he could not afford to give by way of protection, living in cleaner times and furthermore stated JVP Parliamentarians are more prepared to sacrifice their lives for a cause than MPs from the SLFP. All counsel in the case H.L de Silva, S.L.Gunasekera, Manoli Jinadasa and self did not have any security provided or charged fees as it was in our collective opinion, was for a national cause and this is the only case for which as counsel paid a giant legal fee on a bill submitted by the instructing attorneys, firm of Paul Ratnaike, much to the annoyance of his brother-in -law S.L. 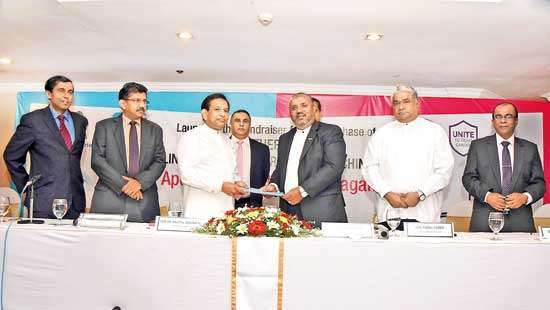 Gunasekera, when I told him months later of footing the bill silently, as he engaged the firm. 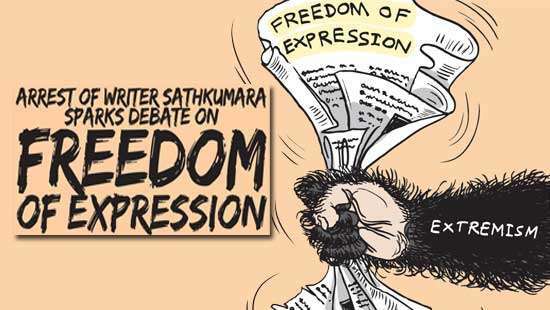 The invoice was paid upfront by the JVP as it was submitted to the petitioners and I reimbursed money to the JVP stealthily, against their wishes, as the bill was too hefty, since we had assured them of a free run on fees, after the yeoman service done by their MPs especially Wimal Weerawansa and Vijitha Herath. That was in a period prior to the defeat of terrorism when RAJAPAKSAs’ were not certain of the own lives next day and all credit to them for the services rendered. They were spoilt and remain spoilt by the sycophants living off them. Manipulators are often manipulated by those close to them. Defeat of terrorism by the Rajapaksa let loose another bout of cronyism just as JR Jayewardene brought it, after opening the economy. Both necessary features in public interest, revolutionised society which was the immediate cause for the re-return and defeat of governments by the people voting in favour and against the regimes of UNP and SLFP, when they in the process tried to dismantle the rights that voters enjoyed by democracy and the rule of law. 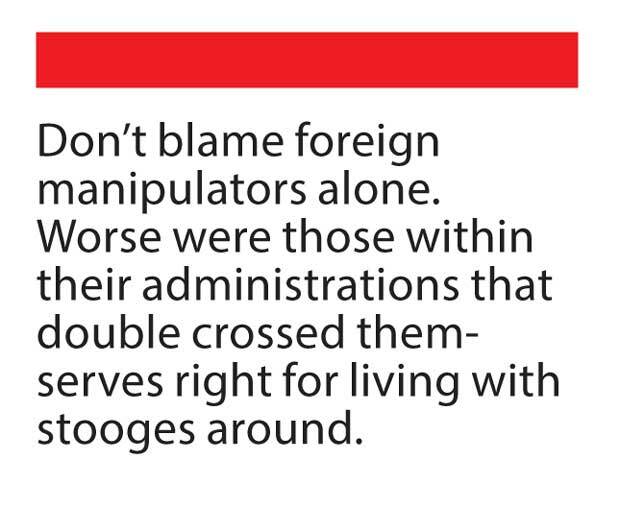 Don’t blame foreign manipulators alone. Worse were those within their administrations that double crossed them-serves right for living with stooges around. The South Korean and French elections saw the emergence of young leaders outside the traditional political formations as winners. Here in Sri Lanka people are totally dissatisfied with the performance of their frontline Parliamentarians from all parties. Parliamentary elections maybe held prior to the presidential election to test the waters before Sirisena takes the dive. Once again the notion of a strong Presidency may arise as Parliamentarians are ruining their reputations.